I sat on the side where I could see everything, and I swear some time during the encores of the Sacrificium concert Cecilia Bartoli turned toward the orchestra La Scintilla and said "Wow!" I had a deeply emotional reaction to this concert which may prove difficult to express in writing. I am getting a bit old for this and don't know how much longer I can keep chasing Cecilia, but I can honestly say I smiled all the way through. The idea here is that Cecilia isn't just singing the music of the castrati, she is embodying one of them. She wore a very nicely designed outfit of men's clothing, including knee high boots, ruffled shirt, vest, jacket and hat, which she proceeded to strip out of as the concert progressed. The hat was first to go. I thought she looked fabulous. Strip stopped after jacket and vest, so not to worry. All of the music was unfamiliar except "Lascia la spina," done as the first encore. The program did not precisely coincide with the album contents, but it came close. The concert had less Graun and more Vinci, but since you never heard of either one of them, this will not matter to you. La Scintilla played well, in my opinion better than I have heard them. Cecilia kept turning to express her approval of what she was hearing. Ada Pesch, their leader, is getting more adept at her conductor role, and things went smoothly. 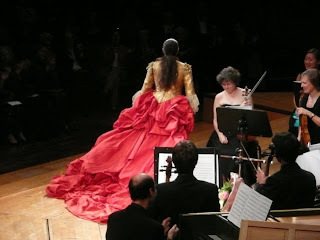 Cecilia Bartoli is an artist who is inspired by challenges. She needs difficulties to rise to. The challenge of the castrati is very high. The reason for their existence is a level of virtuosity not seen in singing before or since. I felt that she rose to meet it. The breath control alone was astounding. But I do not follow her around the world to hear her breath control. It is her musical heart that I love, and it was heard in abundance. The castrati generally performed male roles with their high voices, but occasionally they were cast as the female lead, as in the last two arias on the program. For this Cecilia added an elaborate red skirt and did her best drag queen imitation for some small laughs. Thanks for the delightful review. I hope you enjoy the rest of your overseas trip! The security was very tight, and I didn't figure out how to get back stage. You must not be afraid. IÄm sure the insanity of our relationship extends to noone else. I took pictures but not until the end. My rule of thumb is do what you want as soon as you don't have to worry about the consequences. I'll post one or two when I get home.